Toward the end of the 1970s, Christina Kubisch began to use the technique of electromagnetic induction for her sound installations. As a principle of acoustic transmission, it is based on the sounds resulting from the mutual interaction of magnetic fields. These fields arise on the one hand from electrical wires traversing the room, in which sounds circulate, and on the other from headphones with magnetic coils, which Kubisch developed herself. This system, which she have constantly refined technically as well as artistically, was the starting point of numerous sound installations realized all over the world since 1980. The basic idea of these sound spaces is to provide the viewer/listener access to his own individual spaces of time and motion. The musical sequences can be experienced in ever-new variations through the listener’s motion. The visitor becomes a “mixer” who can put his piece together individually and determine the time frame for himself. 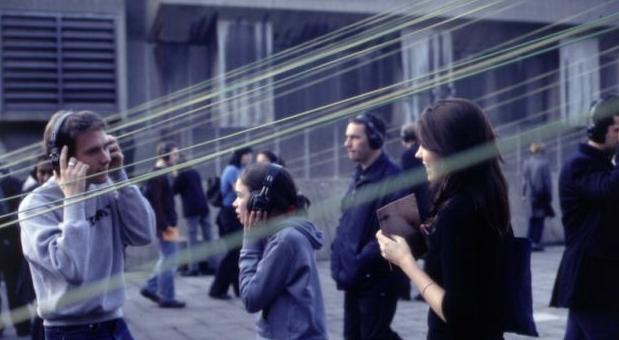 In the first installations, the visitors still had small cubes with built-in loudspeakers that had to be held up to their ears when they approached the fields of wires. Later Kubisch fundamentally improved the freedom of movement and tone quality by developing wireless headphones, with which one can move freely in space. Every movement, even a slight turn of the head, results in different sequences of tones.